Hi gang. Thanks for tuning in last night, I hope you enjoyed the beats. 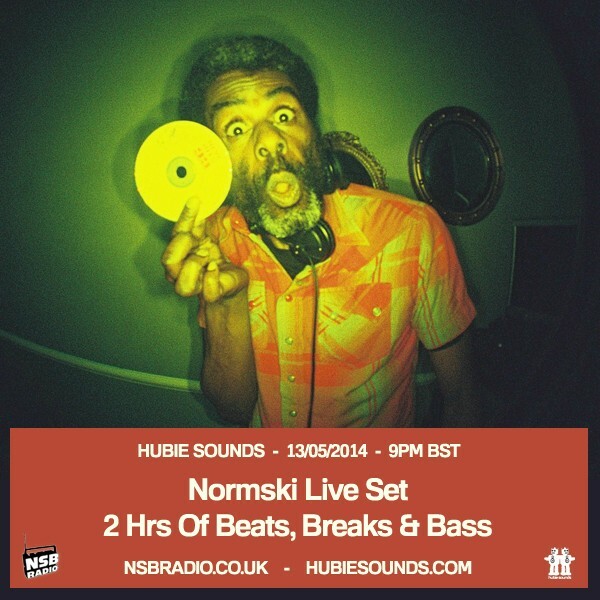 Extra big ups to Normski for a cracking live set and for letting me play it on NSB Radio. For more info about Normski, check out his website. Also make sure you check out his GetTronic show, which airs every friday at 3pm UK time on Hoxton FM. The next Hubie Sounds will be on Tuesday 27th May @ 9pm BST – live and direct on NSB Radio. Hi everyone. Hubie Sounds is back on NSB Radio this Tuesday, after a short break away from the interweb ones and zeros. This time I’ve got an action-packed show in store for you, featuring a wide and varied selection of funk, hip hop, house, breaks and LOADS more! As well as that lot, I’ll also be presenting an exclusive DJ set from the one and only Normski, recorded live at the Rockit Science 6th Birthday Party which recently took place at the Big Chill House here in London. It’s a cracking set, rammed full of classic house and breaks that’s sure to get your booties bouncing for the rest of the week and beyond! 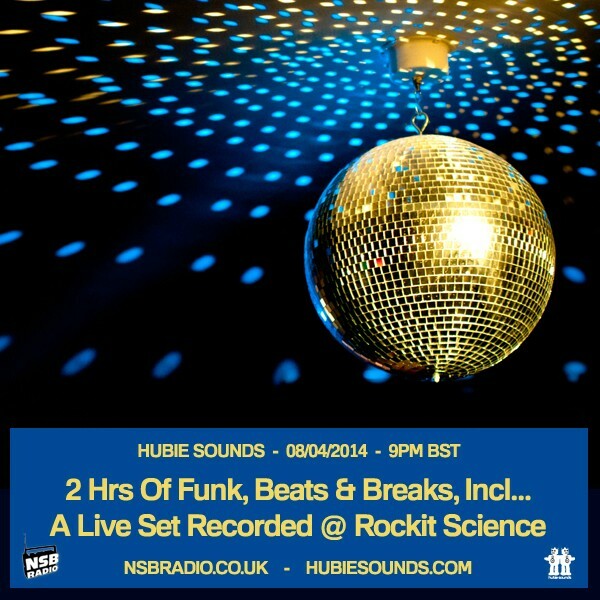 Hubie Sounds 081 – Tuesday 13th May @ 9pm BST – live and direct on NSB Radio! Hi gang. As promised, here is the podcast of Hubie Sounds 079, featuring my Focus On Massive Attack, plus fresh new tunes from the likes of Stanton Warriors and Dirtybird, as well as some classics by the likes of Afrika Bambaataa, Man Parrish and loads more! Nice one, I hope you enjoy the podcast. See you at the Big Chill House for Rockit Science’s 6th Birthday Party with Daddy G (Massive Attack), Andy Smith (Ex-Portishead), Normski (GetTronic) + LOADS More! Make sure you tune into the next Hubie Sounds on Tuesday 8th April @ 9pm BST – live and direct on NSB Radio. Hi everyone, I have some good news and some bad news for you. I’ll kick off with the bad news… unfortunately, due to a prior commitment, I won’t be able to broadcast Hubie Sounds on NSB Radio this Tuesday. As some of you may already know, me and my buddies over at Bass[sic] are involved in the Rockit Science 6th Birthday Party taking place at The Big Chill House, here in London, this Saturday night. This party will feature members of British electronic music royalty, including Daddy G of Massive Attack fame, Portishead‘s Andy Smith, and the legendary Normski! 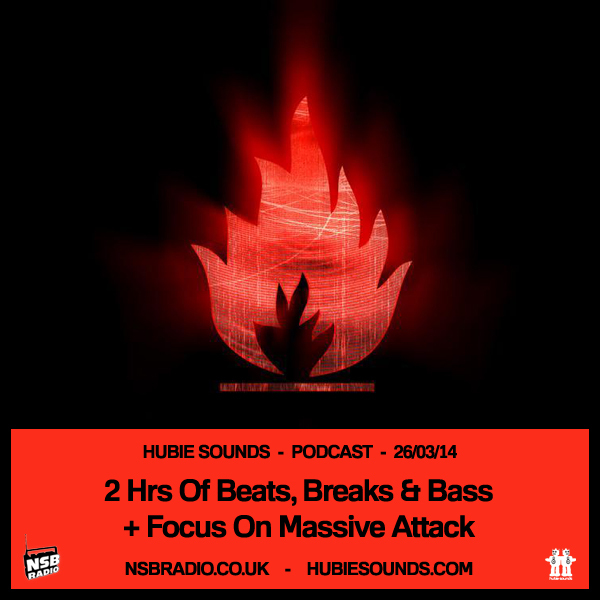 Anyway, to help promote this party, I thought I’d do another Focus On… feature on Hubie Sounds, this time focusing on Bristolian Trip Hop pioneers Massive Attack, featuring a selection of their best tunes from their award-winning albums Blue Lines, Protection, Mezzanine and Heligoland. As well as that, I’ll also be spinning my usual selection of fresh beats and classic tuna from the realms of house, breaks, hip hop and LOADS more! The Hubie Sounds 079 Podcast – Available to stream & download on Wednesday 26th March – Check this website and/or follow me on Twitter for all the updates! Hi everyone and happy bank holiday monday to all my UK crew. 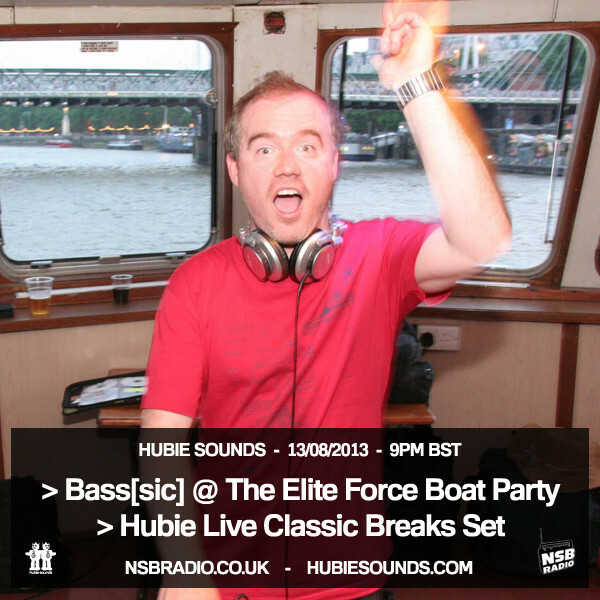 Hubie Sounds returns to the NSB Radio interwaves this Tuesday with the third and final instalment of live sets recorded in the Bass[sic] room on board last month’s infamous Elite Force Boat Party. 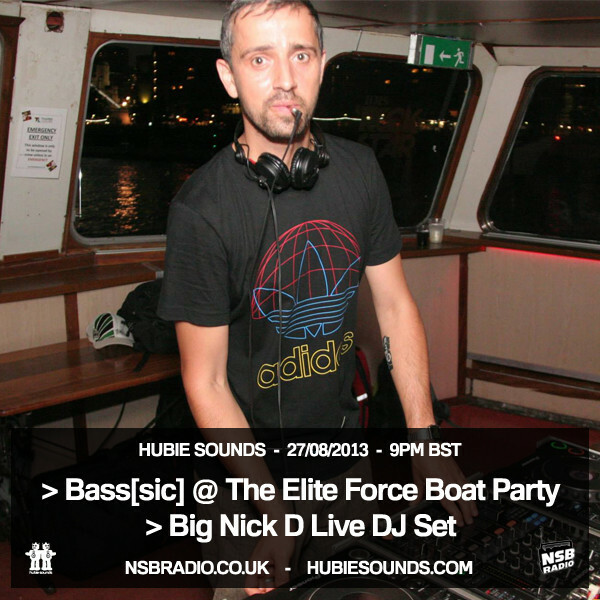 To conclude this run of live sets, I’ll be broadcasting Big Nick D‘s headline set from the boat party, featuring loads of tasty tech house and electro. As well as Nick’s live set, I’ll also be hitting the decks live in the studio with my usual selection of hip hop, house and breaks and loads more! Hubie Sounds 072 – Tuesday 27th August @ 9pm BST – live and direct on NSB Radio! Hi everyone. Thanks for tuning into the show last night, I hope you enjoyed it. I hope you can tune in to the next Hubie Sounds on Tuesday 27th August @ 9pm BST – live and direct on NSB Radio!